ABU DHABI, Jan 16 2013 (IPS), Jan 16 2013 (IPS) - Would those long treks through airport corridors become more tolerable if travellers knew they were creating electricity with each weary footstep? Some enterprising young people at the World Future Energy Summit (WFES) in Abu Dhabi certainly think so. They dream of installing piezoelectricity tiles at airports as a way of generating clean energy. Piezoelectricity comes from mechanical stress or pressure, such as that of footsteps on the ground. This energy can build up in certain solid materials, particularly crystals and some types of ceramics. 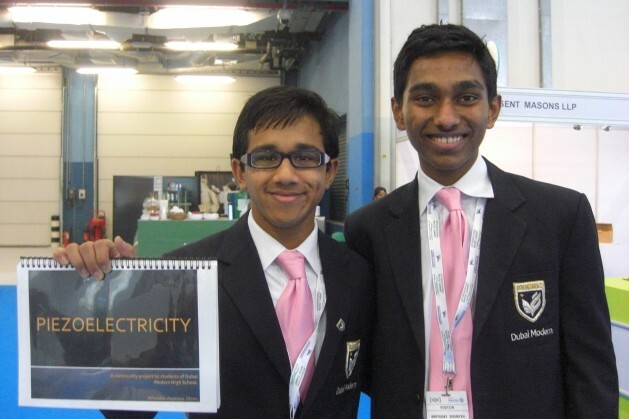 “We can capture this energy using wires and store it in something called capacitors, which are like batteries,” said Anjaneya Malbani, a 16-year-old student at Dubai Modern High School, an Indian-curriculum school in the emirate. He and a group of classmates have drawn up a project that they’ve been presenting at the WFES’s “green ideas” fair. They hope to be selected for a prize that could take the project forward. “We would like to get this in the United Arab Emirates because the UAE is a big hub and the number of travellers here is expected to grow a lot in the coming years,” Malbani told TerraViva in an interview. Piezoelectricity is not a new concept as it was used in sonar during the early part of the 1900s, and has been employed in other applications over the years. The East Japan Railway Company installed power-generating floors at their Tokyo station, for instance, to harvest the energy produced by thousands of moving feet. Tiles with crystals that can retain piezoelectricity do not come cheap, however. Abhyuday Sooriyeh, another 16-year-old student who’s involved in the project, said a tile of one square metre costs around 7,500 dollars. Each footstep creates eight watts of electricity, Sooriyeh explained, and that is even at a leisurely pace. More can be created by running, brisk walking or fast dancing, for instance. Will we be seeing passengers doing the tango through airports in the future? Dancing to generate clean energy could well become a new trend among the upwardly mobile.